A young Kenyan couple became internet sensation after photos from their simple wedding went viral. 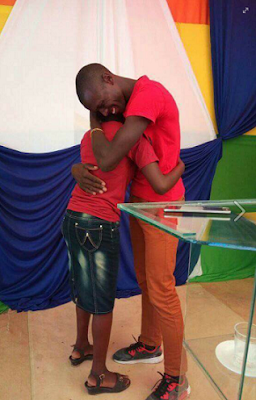 The couple, Ann Wambui, 24, and Wilson Mutura, 26, tied the knot on Sunday, January 22, dressed in T-shirts. Ann wore her T-shirt with a jeans skirt, and no make up. 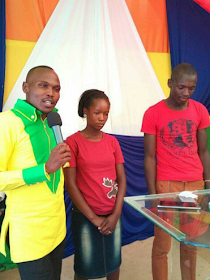 Pastor Ojwach shared the love story of Wambui and Wilson Mutura with eDAILY. "Their wedding took place at our church, Community Christian Worship Centre, in Kasarani area, Nairobi on Sunday, January 22. The two exchanged vows after the sermon. They chose to do their wedding like that because of their financial position. It is quite a long story. "They did not just wake up on a Sunday and decide to be joined together. They have been in a relationship for three years now. I knew them when the guy joined our church after he relocated to the city from Nyahururu. 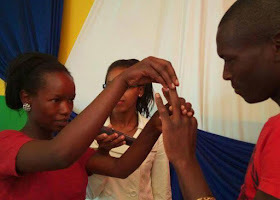 "After some time, Mr Mutura presented his wish to marry Ann. In the beginning, they never wanted to have that big wedding, and so they requested my counseling on that. They were to have their wedding in December, 2016 that was organised by the church, but due to then-unforeseen circumstances, we had to postpone the wedding date. "They had already followed the processes before marriage, such as meeting parents of either family before tying the knot. I got in touch with the families of both Ann and Wilson. "After that, I promised to preside over a simple wedding for them. It wasn’t supposed to be so simple as it turned out. It was supposed to involve presence of few things such as the cake, bridesmaids etc. The guy did whatever he could and asked me to officiate their wedding because they had already gotten the blessings of their parents. 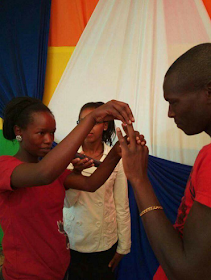 "I took them through a series of counseling before letting them exchange their wedding vows. And now they are wedded. Interestingly, they had no best man or bridesmaid in plan, but two congregants stood up on the day of the wedding and offered to take up the two roles. Mr and Mrs Mutura are currently operating a business of selling fruits, jointly, in Kasarani area. Ann relocated to the city from Nyahururu to join her husband. Pastor Ojwach says the budget of the wedding is near zero shillings since the two only bought rings, and the church will cater for the cost incurred to process their marriage certificate.